Andurand’s 6.8% return in December 2016 took full year returns up to 22.1%. The fund is now up 110% since its inception in February 2013 for new investors (or 127% for those in a legacy share class that carried over the high watermark from Pierre Andurand’s former fund, BlueGold). Meanwhile the oil price, measured by the S&P Crude Total Return Index, has declined 66% over the same period. Pierre Andurand’s cumulative performance of more than 3,600% since he started trading, greatly outperforms the comparable S&P Crude Oil Total Return Index, which returned -79% in the same period. Andurand featured in The Hedge Fund Journal’s biennial “Tomorrow’sTitans” survey back in 2010, sponsored by EY. Though Andurand did put on a range of energy market relative value trades in 2016 (which largely account for gross exposure above 200%), and can, but did not, trade metals and currencies, it was directional calls on the oil price that accounted for nearly all profits last year. This is typical of the career of a man who has participated in all of the big moves in oil prices. A history of Andurand’s directional calls since 2004 is illustrated in Fig.1. He estimates that he has, on average, captured around 70% of each move. Digging deeper into the attribution, performance was achieved without applying leverage to the directional trades. Tactically expanding and contracting core net long exposure to WTI, Brent Crude and associated call options, within a range of roughly 20% and 50%, contributed the majority of returns in 2016. Had Andurand simply maintained a long position of constant size, equivalent to the average net long of just 27%, he estimates that returns would only have been 8% for 2016. Indeed, for the first three weeks of 2016, Andurand garnered some profits from the short side that had been his predominant portfolio theme in late 2014 and during 2015. For the bulk of 2016, he remained long, but was adept at top-slicing the position on rallies and rebuilding it after pullbacks. Tactically trading around a view is important because the fundamental signals can be clouded by “noise”. Andurand admits it was a “surprise that oil prices in January 2017 remained no higher than in June 2016, despite the OPEC cut, lower inventories, lower non-OPEC, ex-US output and cost inflation.” He argues that oil prices have remained range-bound for longer than was logical, due to both corporate hedging behaviour and CTA positioning. Andurand explains how the natural hedger on the demand side – airlines buying jet fuel to secure predictable prices – has disappeared, as it was stung by costs of hedging in 2014 and 2015, having bought forward or future fuel contracts at much higher prices. On the other hand, the natural source of extra selling – US producers – continued to anxiously hedge any price rise to lock in price rises. Prices were capped by this increase in selling hedging activity and decrease in buying hedging activity, leaving the speculators to buy to balance the flows. But they would obviously do that only if prices were kept too low relative to prices justified by fundamentals, giving them a reason to participate on the long side. 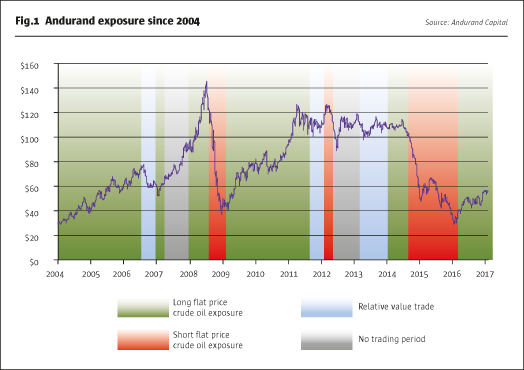 Though Andurand gauges the speculative community is small relative to the corporate hedging flows, he does think that “CTAs have added noise, causing oil prices to overshoot in both directions.” Andurand has noticed faster changes in speculative positioning, with switches between long, flat and short positions sometimes evident within one- or two-week timeframes. Overall, for more than six months there has been something of a stalemate between bulls and bears. Andurand envisages that this will be resolved in favour of the bulls, as the weight of complementary fundamentals overwhelms the technical market factors. “All data points point higher,” Andurand believes. He expects that compliance with OPEC cuts will be good, doubts if US output growth can fill the gap left by declining non-OPEC, ex-US production, and notes how “demand is getting revised up by everyone – the International Energy Agency, the US Department of Energy EIA [Energy Information Administration], and consultants such as Energy Aspects and PIRA [Petroleum Industry Research Associates].” Demand is expected to grow by 1.4 million barrels per day (bpd) this year and 1.2 million per year thereafter, driven by non-OECD countries. Clearly, robust demand is one of many bullish arguments that are now mainstream opinion. Where Andurand differs most from consensus is his outlook for non-OPEC, ex-US supply, where, he says, “We expect a multi-year structural deficit caused by declining supply.” Part of this arises from some non-OPEC members joining forces with OPEC to cut output (as discussed below), but this might only be temporary and there are much bigger structural shifts at play. Andurand estimates that “capital spending has been cut by $450 billion and output has already fallen by 600,000 bpd, with countries including China and Columbia reducing. Exploration spending is also down from $120 billion in 2013 to $60 billion in 2016.” Fields are depleting faster than expected and Andurand expects an inventory deficit escalating from 1.3 million bpd in 2018, to 1.8 million in 2019, and 2.1 million in 2020. This is above the consensus predictions, partly as Andurand thinks that some forecasters are extrapolating from out-of-date decline functions and need to update models with more recent data. 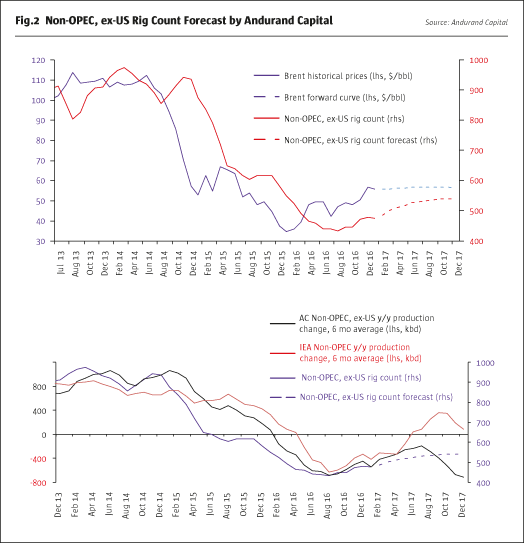 Fig.2 shows how Andurand’s proprietary forecasts for rig counts, and output, have tracked the actual figures more accurately than have IEA forecasts. The magnitude of Andurand’s dissent from consensus should not be underestimated. Now Andurand’s forecasts for 2017 fall short of IEA numbers by a growing margin. By mid-2017, the IEA is projecting stable to higher non-OPEC, ex-US production, whereas Andurand expects a sharp drop in the second half of 2017. The trend in non-OPEC rig counts has historically moved quite closely with the oil price, as shown above. The other problem with extrapolating from recent cost data is that it has been depressed by the “batting average” bias. If weak oil prices choke off higher-cost production – including both conventional, non-shale, US production and higher-cost shale fields – and thereby concentrate increased output into the lowest-cost areas, such as the Texas Permian Basin, the average figure comes down. This is not sustainable, however, as higher prices will bring costlier fields back on stream. Collaboration between OPEC and six non-OPEC members increases Andurand’s confidence in the power of cuts. Though some of those cooperating are in effect merely acknowledging naturally declining production, the commitments made by Russia and Kazakhstan are significant, particularly as Kazakhstan was expected to raise output. “OPEC and Russia are together half of world output, and had increased by 3.1 million barrels per day since 2014,” Andurand points out. Opinions differ on the likely degree of compliance with OPEC cuts. Andurand expects between 80% and 100% compliance, among both OPEC and non-OPEC parties to the agreement. Andurand infers sincerity from the psychology of the situation: “If members had wanted to cheat, it would not have taken so long to come to an agreement,” he surmises. Technical reasons around third-party reporting anyway make cheating harder. Moving to specific countries: Iran and Iraq are both over-reporting output, so they are already more compliant than they appear, according to Andurand. He doubts if Iran can increase its short-term output beyond a temporary fillip from inventories. Longer term, Iran may also find its production growth ambitions hampered if tougher sanctions from the new US administration – which Andurand foresaw in his January newsletter – deter investment. Though Andurand views Iraq as “a bit of a wild card”, he says: “Core OPEC members – Saudi, UAE and Kuwait – should comply.” Libya is falling short of its own targets while Nigeria must contend with a damaged pipeline, and Saudi cuts could accommodate any increases from these two, Andurand judges. Andurand traded physical oil earlier in his career, including proprietary trading at Goldman Sachs and Bank of America, with a spell in Singapore. Though the Andurand fund does not trade any physical commodities, he keeps an eye on the physical oil markets for insights into the derivative markets that the fund does trade. “The physical market is tightening and Dubai time spreads are getting stronger,” he observes. These nascent trends in the high sulphur, medium and heavy sour crude markets should filter through to the low sulphur, light sweet crude markets that provide benchmark contracts, such as Brent and WTI, Andurand expects. This dynamic might increase prices to $70, while the next leg up could come from the implications of backwardation – or a downward sloping forward curve. According to Andurand, an inventory deficit should swivel the market into backwardation, which generates positive feedback loops. “Producers will refrain from hedging and unwind their hedges, while positive carry from positive roll yields will attract consumers and investment flows – both CTAs and passive index products such as the GSCI,” Andurand predicts. Though $70 is Andurand’s estimate of fair value, he thinks the market could overshoot to $80. Andurand’s core trade for 2017 will continue the 2016 stance of staying long on oil, and tactically navigating the volatility. The Andurand team is monitoring relative value opportunities as well, and is aware of the possibility of a Trump border tax pushing US WTI oil to a $10 premium over Brent. This could be a profitable trade, and in 2013 most of Andurand’s returns came from trading around a WTI-versus-Brent spread. But Andurand only uses options when he views them as good value. When we met in late January, Andurand was of the opinion that option prices for the geographic spread were too expensive, having quadrupled in price within days of Trump’s election. As firm assets have grown to $1.6 billion – including four managed accounts – additional hires have been made, including for macro analysis, investment, trade execution, operations and technology functions. Strategy capacity could be at least $2 billion and Andurand has launched a new share class charging 1 and 30 rather than 2 and 20. Longer term, Andurand’s vision is to remain focused as a specialist energy asset manager, and he expects this will eventually include alternative energy.